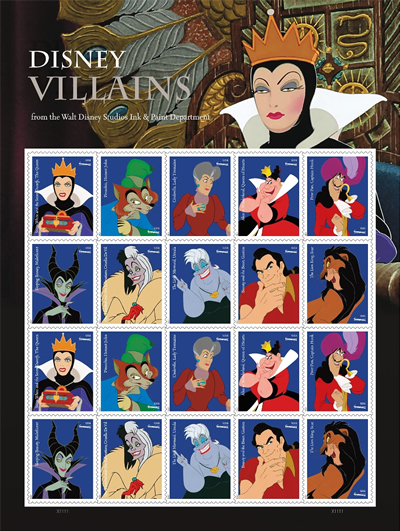 “`The United States Postal Service will celebrate the rich legacy of Walt Disney Studio’s Ink and Paint Department by dedicating a sheet of Forever Stamps, featuring classic Disney villains. This issuance celebrates Disney’s animation that began in 1923. “`Each stamp showcase classic Disney villains: Maleficent (Sleeping Beauty), Captain Hook (Peter Pan), Honest John (Pinocchio), Queen of Hearts (Alice in Wonderland), The Queen (Snow White and the Seven Dwarfs), Lady Tremaine (Cinderella), Scar (The Lion King), Cruella De Vil (One Hundred and One Dalmatians), Gaston (Beauty and the Beast), and Ursula (The Little Mermaid). “`The words USA and FOREVER appear in the top right corner, or bottom right corner of each stamp; the name of the classic villain, and the film in which the character appears, runs along the left edge. The announcement was made over the weekend at the D23 Expo in Anaheim. This entry was posted on Monday, July 17th, 2017 at 1:28 am	and is filed under Blog by Manny Pacheco. You can follow any comments to this post through the RSS 2.0 feed. Responses are currently closed, but you can trackback from your own site.